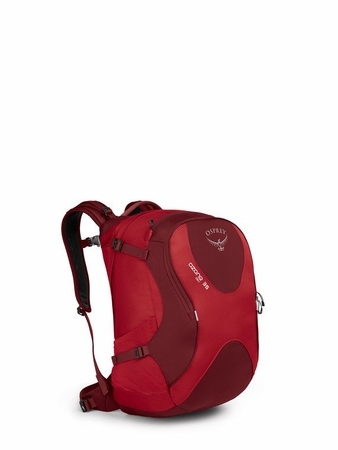 "Ospreys Ozone Travel Pack 35 is sized to carry everything you need for a day hike in the mountains or a stroll in the city. The padded hipbelt and mesh backpanel ensure a comfortable carry. Inside the main compartment you’ll find a padded 15” laptop and a scratch-free tablet sleeve. There’s also a front panel pocket to keep you organized. Exterior compression straps stabilize the pack when you load it up at the local village market. Stretch mesh side pockets give you extra storage for a water bottle or a snack. When your trip is over it’s time to pack up and head home, the Ozone Day Pack 35 anchors to any of the wheeled luggage in the Ozone Series via Osprey’s innovative Handle-It attachment system to create a single rolling unit so you are nimble on the way to the airport. Easily anchors an Ozone backpack or courier bag to Ozone wheeled luggage creating a single easy-to-roll luggage package. Compression Straps - Dual upper and lower side compression straps keep internal loads stable "